The Assad family represents the Alawites , a minority offshoot of Shiite Islam that constitutes 12 percent of the population of Syria. Throughout more than forty years of draconian rule, the Assads, père et fils, have manipulated Syria’s other minorities—Kurdish, Druze, Ismai’li, Jewish, and Christian—by stoking their fears of a takeover by Sunni fundamentalists and then vowing to prevent it. In exchange, these groups have given the regime their nominal support, which the Assads have then trumpeted as evidence of a policy of benevolent protection. In the political struggles of the Middle East, Christians—all too aware of their minority status—historically have survived by supporting whatever group has come to power. This has put them in the position of being reliant on the protection of ruthless dictators, a fact not lost on the Islamist extremists who have infiltrated the Syrian insurgency. UN observers have documented attacks  against Christians singled out for retribution as a result of their pro-Assad affiliation. Along with other minorities who enjoyed the government’s protection, they have been expelled from their ancestral lands, and in some cases kidnapped, raped, and murdered. The Christians of Syria represent a diverse variety of ancient traditions. Western Christians are apt to be most familiar with the Byzantine, or Eastern family of churches, represented by Greek Catholics, or Melkites, as well as Greek Orthodox. Along with the Armenian Church, Syriac Christianity  belongs to the lesser known family of Oriental churches. Armenians found safe haven in Lebanon and Syria following massacres in Turkey early in the twentieth century. Understandably, they dread Turkish intervention, but their anxieties are shared by other Christians as well. While the Assad government allowed Armenian and Syriac, the indigenous languages of its Christian minorities, to be taught and used in worship, Turkey’s commitment to its ethnic minorities is open to question. It continues to place restrictions on when and where religious services are conducted, and its much-vaunted program in support of minority languages has yet to be fully tested. The roots of Syriac Christianity go back to Christianity’s very first converts, drawn from the Aramaic-speaking Judaism which flourished in Mesopotamia beginning in the period known as the Babylonian Captivity (587–38 BC). The spread of Christianity followed ancient trade routes that linked Babylonian Jews to their ancestral homeland in Palestine. How Babylonian Jews eventually came to embrace Christianity is not entirely clear, but the eminent Scripture scholar Michael Weitzman  has developed the most historically plausible scenario. Following the destruction of the Temple in 70 AD, Weitzman writes, Jews “turned to seek salvation for the individual and their group, which Gentiles might enter as proselytes. Later, this group might have embraced the church, which shared its dearest values—prayer and faith—while providing a rationale for the neglect of ritual.” Such a process would explain not only Syriac Christianity’s enduring rootedness in Hebrew scripture, but also its cultural and literary links to Jewish Aramaic culture. It is ironic that the Semitic cultural and linguistic context of early Christianity has been so thoroughly obscured. Jesus, after all, was an Aramaic-speaking Jew, and many early converts to Christianity spoke Syriac, a form of Aramaic which diverges only superficially from the Aramaic spoken by Jesus. Through the fourth century, this distinctly Semitic expression of Christianity remained largely untouched by the influence of classical philosophy that dominated Christian thought in the West. Aramaic is widely associated with the Bible and the Dead Sea Scrolls, but its role as a Christian language with a rich literary tradition of its own is rarely acknowledged. Building on the literary legacy of its origins in Judaism, native Syriac Christianity produced an enormous body of literature that articulated a distinct understanding of the faith, all in the Syriac dialect of Aramaic. 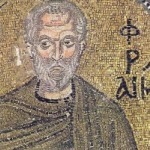 By the fourth century the stage was set for an explosion of creative energy that was ignited by the Christian poet and teacher Ephrem the Syrian .